The powerful arhtiya lobby in Haryana has managed to completely roadblock the procurement of paddy by Food Corporation of India (FCI) in the state. With the premier procurement agency making direct payment to farmers, bypassing these commission agents, the latter have ensured that the agency does not get to procure paddy in the state. In a glaring breach of court security, a person today managed to take a country made pistol inside the court room of Hem Raj Verma, Additional Civil Judge, and tried to shoot him. However, the pistol failed to fire. In the meantime, he was nabbed by the police personnel present in the court. Post-Hisar Lok Sabha byelection, the Haryana government tonight transferred deputy commissioners of eight districts, including that of Fatehabad, which will face a byelection in the near future. In all, 14 IAS officers have been shifted. The police has announced a reward of Rs 50,000 for clues to nab miscreants who had recently fired shots and demanded ransom from a showroom owner here. Three persons — identified as Jai Karan (50), his son Sandeep (28) and cousin’s wife Babli (35) — of a family were shot dead at Bhainwal Kalan village allegedly by armed persons of a rival group in the village. Jai Karan and Babli died on the spot and Sandeep succumbed to his injuries on the way to the PGIMS Rohtak. Rail traffic on the Ambala-Delhi section remained disrupted for hours as three rear bogies of the Kalka-Howrah mail got derailed near the Safiabad level crossing early this morning. While Haryana farmers, their associations and opposition parties have been criticising the state government for its failure to procure bajra, now the ruling party’s own spokesperson has also joined the chorus. Corruption and the recent people’s movement against the menace will be the topic of deliberations in the 15th annual national conference of the Indian Political Economy Association (IPEA) beginning in the Chaudhary Devi Lal University here tomorrow. Justice Daya Chaudhary of the Punjab and Haryana High Court today urged judicial officers and lawyers to work towards providing speedy justice to litigants in a transparent manner. In a major decision to further assist destitute children, the Haryana Government has decided to revise income ceiling under the “Financial Assistance to Destitute Children” scheme from Rs 10,000 to Rs 30,000 per annum. The police has arrested a gangster who had snatched a motorcycle, cash, an ATM card and other documents of a local resident at gunpoint on Wednesday night here. Two youths were feared dead, when they were swept away by the strong currents of the Bhakhra Canal at the Baliala Head near Tohana town today. The police has registered a criminal case in connection with an attack on a lawyer of the district court and his family members at his residence in the Janata Colony in the NIT-2 area on Wednesday night, but has not made any arrest. “Work for inclusion of at least 50 new votes in each of the 116 villages of the constituency in the next four days and get an equal number of fake votes of your opponents deleted, and the bypoll is yours.” This was the message Indian National Lok Dal (INLD) supremo Om Prakash Chautala gave to his party workers at a meeting addressed by him here today. The INLD chief set the ball rolling for the impending bypoll for Ratia Assembly seat with Chautala exhorting his party workers to take this election as an opportunity to avenge Hisar defeat. Ratia Assembly seat had fallen vacant after the death of INLD MLA Gian Chand Odh and byelection for this seat is expected by February next while Adampur seat was vacated by newly elected MP from Hisar Kuldeep Bishnoi. The Election Commission is seeking claims and objections by November 1 for the final publication of new electoral rolls by January 5, 2012. Chautala told his party workers that the inclusion of new votes of their sympathisers or the deletion of fake votes of the opponents at this stage could prove crucial to the outcome of the bypoll. Addressing party workers from the district, particularly from Ratia Assembly segment, the former chief minister said the INLD had lost the battle, but won the war in Hisar, as the vote share of his party had increased considerably. Ratia bypoll, he said, was an opportunity to avenge the loss at Hisar and also to make amends to whatever mistakes party might have committed in that election. He said as the forthcoming bypoll has been necessitated by the death of his party MLA, winning the seat is a matter of prestige for the INLD. He urged his party workers not to feel dejected due to defeat in Hisar byelection, as the real target of the party was the coming Assembly polls. He said the results of Hisar bypoll had confirmed beyond doubts that the Congress had no future and the HJC/BJP combine had no base of their own, as Bishnoi, he alleged, won due to a “tacit understanding” between him and the Congress. Chautala said Ratia has been a traditional stronghold of the INLD, and his party, he claimed would not only win the seat, but would also improve its margin of victory. No wonder that as against a total paddy procurement of 23.95 lakh tonnes in different mandis of Haryana, the FCI has so far procured just 56 tonnes of paddy. While private traders have purchased 57,800 tonnes of paddy, different state government agencies have made bulk purchase, totalling to 23.38 lakh tonnes. Top officials in FCI, Haryana, informed The Tribune that the main reason for the negligible purchase of paddy by the agency was that arhtiyas were resisting selling of paddy to the FCI. “This year, we have introduced the system of making direct payment to farmers. Since the lobby of arhtiyas is quite strong, they are resisting selling of paddy to the FCI in the 30-odd mandis allotted to us, and instead promoting sale to different state government agencies. Also, there is no vigorous demand from the state government on the FCI to purchase paddy,” said the official. Traditionally, the FCI has been given a target to purchase at least 10 per cent of the total paddy that arrives in Haryana mandis. But this time, so far, the FCI has purchased just 0.002 per cent of paddy. Officials in FCI said that generally the agency’s market intervention in Haryana has remained low and they have purchased much less than the target of 10 per cent given to them. “Last year, the FCI purchased 31,000 tonnes of paddy, while the state government procured 24.82 lakh tonnes of paddy. But never ever has the purchase been negligible as during this year,” he said. FCI officials said that another reason for the poor participation of the FCI in procurement of paddy in Haryana was that the milling policy of the FCI was different from the milling policy of state government agencies. “The state government agencies purchase paddy and allot it to the miller at the mandi itself, who then transports it, mills it and stores it for them. But in the case of the FCI, the agency itself purchases and transports it to FCI godowns. The paddy for milling is given to the miller only against the milled rice that he advances to the FCI. As a result, the millers, too, are not keen on milling our paddy and prefer working with state government agencies,” he said. The incident took place at around 3:15 pm when the judge was hearing a case on the first floor of the district court complex. A man, later identified as Surinder Singh of Pyont village of the district, entered the court room. After reaching the witness box, he took out a country made pistol and aimed at the judge. Though he pressed the trigger to shoot the judge, his pistol failed to fire. Meanwhile, constable Gurjit Singh of Indri police station, who at that time was present in the court room, pounced on the accused. He pushed the pistol away even as the accused tried to fire twice, but failed again. Another constable Raj Kumar, who was also present in the court room, also swooped on the accused and the two policemen got hold of him. He was immediately placed under arrest and the weapon was confiscated. The police also recovered two bullets from his possession. DSP S S Bhoria, who interrogated the accused, said that there was a case related to a loan and Surinder had sought to buy a canter. He was in dispute with one Jagjit Singh in the case. He said that the final verdict in the case was pronounced by the court of Hem Raj Verma, which was not in Surinder’s favour. He said that recently his father had died which frustrated him further and he decided to eliminate the judge. He said that Surinder went to Bareilly in Uttar Pradesh from where he bought the country made pistol for Rs 7,000, which which he tried to kill the judge. A case under Sections 449, 307 120 B of the IPC and Sections 25/64/59 of the Arms Act has been registered against the accused on a complaint filed by the judge himself. Former UT Home Secretary Ram Niwas has been posted as Financial Commissioner & Principal Secretary, Development & Panchayats. Chander Parkash, DC, Jhajjar, goes as Secretary, Haryana Board of School Education, Bhiwani, replacing Shekhar Vidyarthi, who will be new DC of Ambala in place of Sameer Pal Srow. He will replace Yudhbir Singh Khyalia as DC of Sirsa. Khyalia comes to adjoining Fatehabad. CR Rana, DC, Bhiwani, replaces Rakesh Gupta as Special Secretary, Health Department and Mission Director, National Rural Health Mission and Commissioner, Food & Drugs Administration. Gupta will be new DC of Faridabad in place of Praveen Kumar, who becomes Administrator, HUDA, Gurgaon, in place of Nitin Yadav, who will be new DC of Bhiwani. Vijay Singh Dahiya, DC, Fatehabad, goes to Palwal as such. Amneet P Kumar, DC, Kaithal, will be new Administrator, HUDA, Faridabad, in place of Ajit Balaji Joshi, who goes as DC, Jhajjar. A Mona Sreenivas will be new DC of Kaithal. RC Verma, DC, Palwal, will now be MD, Haryana Agro Industries Corporation. In the police reshuffle, the government has tried to strengthen the CID department. The reshuffle has affected 31 IPS and HPS officers. SS Deswal, Commissioner Police (CP), Gurgaon, becomes ADGP, CID. AK Dhul, IG, Karnal range, will be new CP of Ambala-Panchkula. BK Sinha will be IG/IRB Bhondsi. KK Sindhu, CP, Ambala-Panchkula, goes as such to Gurgaon. KK Sharma will be IGP/Telecom. PR Deo goes as IGP/RTC Bhondsi. KK Mishra has been shifted as IG, State Vigilance Bureau(SVB). V Kamaraja is new IG, Railways & Commando. PK Agrawal will be IG, CID. Sudhir Chowdhary becomes IGP/South Range. Mohd Akil will hold additional charge of Director, HPA. SS Kapoor will be new CP, Faridabad. Balbir Singh will head Karnal range. Om Parkash Singh has been promoted as IG and posted as Director, Sports. Ajay Singhal has been posted as IG, SVB. Raghbir Singh becomes IG, State Crime Record Bureau. Alok Mittal goes as IG, Rohtak range. AS Chawla will be new IG, Hisar range. Rajpal Singh becomes IG, Crime. PS Ranga will be IG, Training. SK Jain goes as DIG, Home Guards. Shrikant Jadhav will be DIG, Crime. Anil Kumar goes as Joint CP, Faridabad. Vikas Arora, SP, Hisar, goes as such to Rewari. Hardeep Singh Doon becomes SP, Railway. Vivek Sharma, SP, Fatehabad, will also hold the additional charge of SP, Hisar, from where he was shifted during the byelection on the complaint of the INLD. Naazneen Bhasin, SP, Railway, goes as DCP/HQs/ Faridabad. Ved Parkash, HPS, will now be AIG, Welfare. Ram Kumar, HPS, goes as DSP/HPA Madhuban. Om Parkash Narwal, HPS, becomes DSP/RTC, Bhondsi. Krishan Murari, a politically connected HPS officer, who had been working as ACP, Sadar Gurgaon, has now been moved to a comparatively low-key post of ACP, Traffic, Ambala. While stating this here today, a police spokesman said information about the suspects could be given to Dinesh Kumar, Deputy Superintendent of Police, Headquarters, on mobile no. 9996200402 and Rajpal, CIA in charge, on mobile no 9996200417. He said police teams under the supervision of the DSP were raiding different places but had not yet been able to nab the accused involved in the crime. The police would soon bring Sombir on production warrant for investigation. He had been linked to this incident and was lodged in the Tihar Jail. He said the CCTV cameras would be set up at the Parijat Chowk on pilot project basis to nab persons involved in stealing vehicles. Thereafter, the CCTV cameras would also be set up at other important places in town. Meanwhile, the police has decided to give a reward of Rs 500 to those who bring accident victims to hospitals for treatment. He said no private hospital could refuse to admit road accident victims for treatment. A written communication to this effect was being sent by the Civil Surgeon to all private hospitals. In protest against the killings, the family members of the victims did not allow police to take possession of the bodies of Babli and Jai Karan for conducting a postmortem examination. After receiving the information about the tense situation in the village, the SSP K.K.Rao reached the village to convince the people that the alleged accused would be arrested soon and the legal procedure of postmortem examination should be allowed to be completed for taking further action in the case. According to information, the armed miscreants reached in the village in three vehicles and fired indiscriminately at the family member of Ram Kishan. They managed to escape after committing the crime. An old enmity between the families of a former village Sarpanch Mukesh, who was shot dead about a year back, and of Ram Kishan is suspected to be reason behind the murders. The 70-year-old, Ram Kishan, father-in-law of Babli, was shot at and injured seriously when he was allegedly attacked by the members of Mukesh’s family on October 26. A case of attempt to murder was registered against five persons belonging to the Mukesh’s family. Ram Kishan is recovering at the PGIMS, Rohtak. Though, there were no reports of casualities, it caused a lot of harassment to passengers of trains that commute between Ambala and Delhi as the trains were delayed, rescheduled or cancelled. The traffic on the said route was restored after 2.30 pm. Railway sources said the last compartment of the Kalka-Howrah mail comprising guard cabin, luggage store and reserve portion for women got derailed, while the train was crossing Rathdhana railway station around 5.30 am. It also led to the derailment of two other connected bogies, including one of railway mail service (RMS) compartment and a general category compartment. Divisional Railway Manager Ashwani Lohani along with a team of technical experts from Delhi reached the spot to initiate remedial measures. A team of railway police force official also reached the spot. Ashwani Lohani later told mediapersons that after disconnecting the ill-fated bogies, the Kalka Express left the spot at 7 am for the destination. He said a team of experts was yet to ascertain the exact reason for the incident. He said the team would be submitting a report soon. The last bogies were badly damaged and were left on the spot to be destroyed later, while the other two bogies were sent to Delhi railway workshop for repairs. The rail authorities diverted the mail and express trains through Panipat-Gohana-Rohtak-Delhi route at 9 am. Two trains, including the Jelam Express and a passenger train between Ambala and Delhi, remained stationed at Kurukshetra and Karnal stations for nine hours, while six passenger trains on the Ambala-Delhi route were rescheduled. In a statement issued here today, Haryana Congress former spokesperson Ved Parkash Vidrohi expressed disappointment over the non-procurement of bajra by the government agencies till date. “Though the government had fixed Rs 980 per quintal as the minimum support price (MSP) for bajra, its agencies have failed to procure bajra despite official announcements being made to this effect,” said Vidrohi. At a recent meeting of the National Development Council, Haryana Chief Minister Bhupinder Singh Hooda had urged the Centre to reverse the norms set for procurement of bajra to the pre-2009 period. Before 2009, the Food Corporation of India used to take over all bajra stocks procured by state agencies. However in 2009, the Union Government revised the norms for procurement. The revised norms are so stringent that they have made the procurement process difficult. This has been a setback for the cultivation of bajra in rainfed areas, thereby adversely affecting small and marginal farmers. Earlier, the Haryana Government had maintained that it had made all arrangements for smooth procurement of bajra during the kharif marketing season 2011-12. Haryana Food and Supplies Minister Mahender Partap Singh had stated that about 2.50 lakh metric tonnes of bajra might arrive in the mandis of the state. The two-day conference is being organised jointly by the IPEA and the Department of Economics of the host university. Nearly 300 delegates from all over the country are likely to participate. Manoj Siwach, Registrar and Dean, Faculty of Social Sciences, said Vice-Chancellor KC Bhardwaj will inaugurate the conference, while V Upadhyay, Department of Humanities and Social Sciences, IIT, Hauz Khas, Delhi will preside over. “Dispossession of People” is another theme of the conference, which will include the question of land, forest, water and other natural resources. “Land acquisition, land grab, changing land uses, land struggles”, “Rights of adivasis and forest laws” and “Sustainable use of water and other natural resources” are some of the topics under this head. “Issues in Social Development, Environmental Sustainability, Right to Food Debate, and Democracy and Dissent Discourse” and “Two Decades of Liberalisation and Globalisation: Emerging Trends in India and Elsewhere” are the two other themes of this conference, said Siwach. 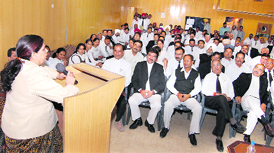 The judge, who was on a visit to Sirsa for inspection of courts, addressed judges and lawyers in the local Bar Room. She said poor litigants looked upon judges and lawyers for mitigation of their grievances through speedy justice, and hence it was duty of all, who were part of the judicial system, to live up to their expectations. Justice Chaudhary said the legal profession was one of the biggest means for the service of society, and exhorted lawyers to perform their duties in a manner that help the society. She said Mahatma Gandhi never treated the legal profession as a means of earning, but he treated this as a means to serve the society. She called upon lawyers to strike a balance between the commercial and social aspect of their profession, so that they could serve the litigants’ interests in a better manner. Ramesh Mehta, President of the District Bar Association, Sirsa, placed some demands like creating some more courts and providing more chambers to the lawyers, to which the judge said she would take up their demands with the high court. Welcoming Justice Chaudhary, additional district and sessions judge Neelima Shangla said she had taken a incredible journey from a village to the high court through her sheer hard work and dedication. Justice Chaudhary also visited the district jail here and spoke to prisoners to know their problems. Haryana Social Justice and Empowerment Minister Geeta Bhukkal said this decision would cover a large number of beneficiaries under the scheme. She said the budget provision of Rs.28 crore had been made for the current financial year against Rs.22.90 crore spent during 2010-11 under the scheme. The gangster was arrested during a naka laid by the police here yesterday. He was produced in the court today, which sent him in a police remand for interrogation and to facilitate the recovery of looted cash and other documents. A police spokesperson said the victim, Aatish Bajaj, was having a cold drink near old bus stand here when a youth requested him to drop him at new bus stand. Aatish agreed to drop him but on the way another youth met them and tried to ride their motorcycle following which Aatish refused to oblige both of them. Three other youths riding another motorcycle joined them and took Aatish near drain behind Hero Honda agency. The gangsters snatched the valuables from Aatish at gunpoint. Later, Naresh was arrested by the police while he was driving the snatched motorcycle near Dhand road here. 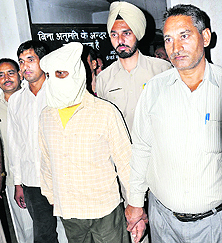 Efforts to arrest four of his accomplices identified as Anil, Satish, Vikram and Pardeep were on. Sonu (27), of Tohana, had gone for an outing to the Baliala Head with his brother-in-law, Birju (26), who had come to see his sister on Bhaiya Dooj festival. The two were consuming liquor on the banks of the canal, when Sonu descended the stairs of the canal to take water and slipped into the deep waters. Birju jumped into the canal to save Sonu, but both were swept away by the strong currents. Labourers working nearby informed the police. Family members of the two identified the slippers of the victims. Local divers were making efforts to find the victims. The accused allegedly looted jewellery, cash and silver statues from the house after attacking family members. Deepak Kapoor, the victim lawyer, said four persons, including the main accused, a lady and her husband, had been named in the FIR.